Former Scotland forward Kevin Gallacher believes Gordon Strachan's current side have a healthy hunger to succeed. The Scots take on Denmark in Tuesday's friendly at Hampden, having beaten Czech Republic in Prague on Thursday. "It's fantastic that everybody wants to play and everybody wants to turn up," Gallacher, 49, told BBC Scotland. "You're expecting players to step up to the mark because they're all wanting to play in the first XI and that's the way Gordon's got them playing." Gallacher, who won 53 caps and scored nine international goals, was "very impressed" with Scotland's 1-0 win last week. Strachan picked separate squads for the two friendlies, with a handful of players featuring in both. But Gallacher expects similar tactics against the Danes. "Every game you win breeds confidence," said Gallacher. "The players that have done their job against Czech Republic will be looking over their shoulders at how the other squad get on against Denmark." Like the Scots and unlike the Czechs, the Danes will not be taking part at this summer's Euro 2016 finals. 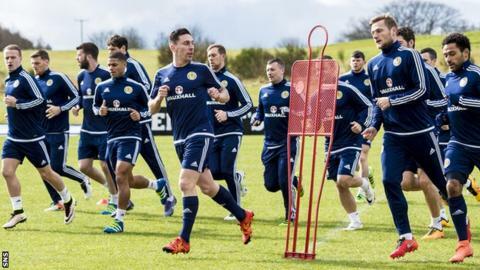 "They didn't qualify, but they've got a good bunch of players in there," said Gallacher. "I'm expecting a similar game, a high pressing game." Scotland will play the French and Italy later this year as part of their preparations for the beginning of the World Cup qualifying campaign in the autumn. With Steven Fletcher ill last week, Ross McCormack played the lone striker role against the Czechs. Marseille's Fletcher, who is on loan from Sunderland, is available again for Tuesday's game, while Celtic's Leigh Griffiths and Derby County's Chris Martin being the other forward options for Strachan. "Does he give Chris Martin a start on his own up front? Does he play that way or does he play with the two up front?" asked Gallacher. "There's one or two options in there. "Griffiths is an option, there's no doubt about it, but he did go for Chris Martin against Gibraltar. This might be an opportunity to give Leigh Griffiths a start. "Would Leigh Griffiths be the one that can lead the line or does Leigh Griffiths like to play off someone? "He might play both of them together." Captain and midfielder Scott Brown is expected to win his 50th cap and thus join Gallacher in Scotland's Hall of Fame. Gallacher described Brown's caps haul as a "fantastic achievement" and added: "Hopefully, if he's playing, he'll go out and enjoy it and have a nice result to go with it."